The NSW Country Development Tournament (CDT) is an annual event hosted by Basketball NSW to assist players, coaches and referees from both regional and metropolitan associations with individual skill and concept development. The annual tournament was hosted by both the Newcastle Basketball Association and the University of Newcastle. The event is targeted at participants identified as potential Country participants for the following years ACJBC, in the U15 & U17 age groups or for Metro participants in the East Coast Challenge. Basketball NSW General Manager Coaching and Development, Brett Coxsedge was amazed by the standard of the “fantastic upcoming talent” that was demonstrated throughout the four-day event. “The CDT is always a fantastic event as it really showcases the rich, young talent we have on offer across NSW especially in our Country regions,” Coxsedge said. The East Coast Challenge (ECC) is an annual event that sees NSW Metro U16 Boys’ & Girls’ teams and U18 Boys’ & Girls’ teams compete against teams from Victoria, South Australia and ACT in a round robin style tournament held in Manly. The U16 teams were made up from athletes in the State Performance Program and Developing Athlete Program while the U18 teams consisted of the final 20 athletes that remained in the NSW Metropolitan U18 State Team selection process for the upcoming Australian Junior Championships, held in April. NSW Metro High Performance Coach, Sam Gruggen was thrilled with the level of intensity that was on show across the three-day tournament. “I was extremely happy with the level of increased physicality and intensity that our NSW competitors showed across the board,” Gruggen said. The Australian Country Junior Basketball Cup (ACJBC) is an annual tournament in which upwards of 60 teams and 700 players, coaches and officials take part including teams from Tasmania and New Zealand in the U14, U16, and U18 age groups. The tournament, hosted by Albury began with a two-day training style camp before being placed in teams, followed by six day round robin competition. NSW Country High Performance Coach, Curtis Sardi said that he was very pleased about the overall tournament and the development of our Country junior athletes that attended the week-long camp & event. “The standard of competition continues to improve year after year at the Australian Country Junior Basketball Cup as it showcases our Country juniors and gives them an opportunity to become better players and people on and off the court,” Sardi said. “This type of tournament is really important for our athletes to learn and understand our BNSW pathways and selection processes. The athletes that were lucky to have attended the ACJBC will have been able to walk away with the understanding of fundamental skill of self-assessment and self-identification that will enable their process into our state and possible national pathways,” Sardi said. Well done to our 14 ACJBC teams that competed and a special congratulations to our U18 Boys Kookaburras who came away with first place in their age group & the U16 Kookaburras who finished in second place. 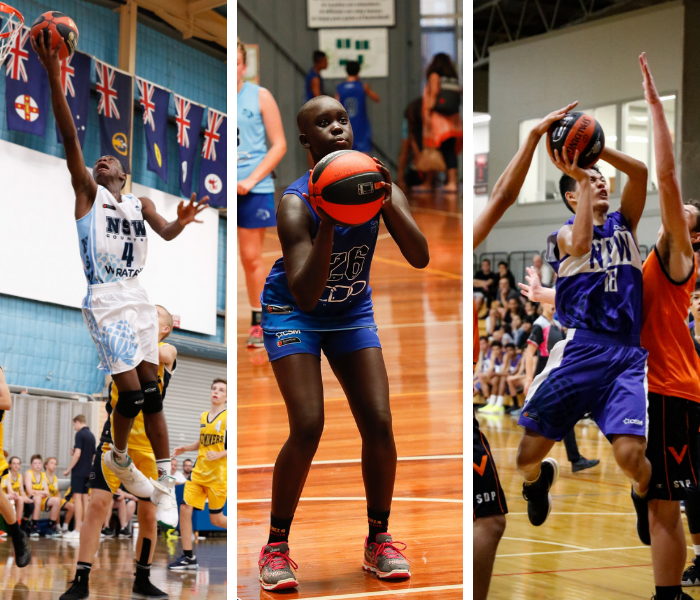 New South Wales’ best Metro under-14s and under-15’s athletes, along with Country under 15’s gathered at the State Basketball Centre in Victoria to take on Australia’s best talent at the 2019 Southern Cross Challenge. This was the first time that NSW has attended the event in a number of years. The four-day tournament showcased a wide range of development opportunities for not only our NSW based athletes but also coaches, managers and promising referees in an elite based tournament situation. “The SCC is a fantastic tournament that allows our U14 and U15 athletes the first real opportunity to compete against the majority of the other States in Australia in a Nationals-like environment with teams from Vic Country/Metro, SA Country/Metro, WA Country/Metro and the ACT present,” Coxsedge said. Well done to our four Metro and two Country squads that competed.